Evaristti was on a long stay in Bangkok in 1995 as visiting professor at the Silipakorn Fine Arts University. In Bangkok, Evaristti experienced the struggle between life and death at close quarter with over thirty road traffic casualties every day. This work was originally part of the “Eye go black” exhibition in 2000, where the photograph was seen first, then the missile and lipsticks and finally a table with ten blenders containing living goldfish. The option of blending goldfish stole the thunder from the rest of the exhibition. Terrorialista is a silver patina bronze sculpture in 28 parts, which together form a complete human body. However, this is not a nice and regular jigsaw puzzle where all of the pieces fit neatly together, but instead are parts that have been stripped away from the rest of the body. In 2003 Evaristti was commissioned to produce a work for a single day at Trapholt. On the day of the exhibition Evaristti invited a Muslim woman from Lebanon to the museum. The aim was that on the day of the exhibition the two would visit shops in Kolding and purchase the ingredients to make a suicide bomb. "Me and my Ferrari Forever" is an incomplete work - incomplete because it requires an embalmed body, a corpse that will sit on the driver’s seat of a Ferrari 308 GTB. Death is a recurring theme of Evaristti, and here it is combined with the dream of a Ferrari and the question of dealing with the deceased. On a cold February day Marco Evaristti settled down in a latex-upholstered caravan fitted out by the furniture company Montana at Maria Kirkeplads in Copenhagen, a place where the hardest drug addicts come. Evaristti had a mixture of heroin, double cream, lacquer and insecticide in the caravan, which he asked the visiting drug addicts to paint with. In 2004 Evaristti travelled to Greenland armed with red food colouring with the intention of establishing a provisional Pink State by painting an iceberg in Ilulissat Ice Fjord. That year the ice fjord had just been put on the UNESCO World Natural Heritage List and was also the subject of discussion on environmentally-caused climate change. With references to, among other things, cannibalism, Polpette al Grasso di Marco contains a critique of and commentary on today's consumer culture in which we consume too much food and buy our way to slimness via liposuction, which is a fully accepted science. Rolexgate was produced using gold and diamonds that form a model of the infamous entrance to the Auschwitz/Birkenau concentration camp in Poland. A small train is entering the building. The train is led with thousands of small, sparkling diamonds. In the early 1960s Asger Jorn undertook a number of so-called ‘modi cations’ to the paintings he had discovered in second- hand shops in Paris. The intention was to thematise painting traditions, the circulation of images and their ability to be placed into new contexts. As soon as Evaristti had completed The Ice Cube Project he decided that the project would continue with further land reclamations. After having included the Arctic Ocean he would continue by including the highest point (in Europe), Mont Blanc and then the hottest and driest, the Sahara. In December 2007 Marco Evaristti travelled to Huntsville in order to visit prisoner number 000800, Gene Hathorn, on Death Row in the prison. The purpose of this was to meet an actual person who had been sentenced to death because he had committed a murder. In 2008 the Sahara Desert would be included in the Pink State project. Despite a broken leg (in pink plaster!) Evaristti and his team ventured out into the desert. With his base in a Bedouin camp, he searched a larger area and found his sandbank at a place where the infinitely large landscape of the Sahara just becomes visible and Evaristti could carry out some colour tests in the sand. On the opening day for the first complete showing of the Pink State project in Kunsthalle Krems in Austria, Evaristti was forging ahead with a new transitory material – red smoke. From the airspace above the Kunsthalle he dropped his “smoke bomb” from a helicopter which released a cloud of smoke that immediately mixed in with the clouds. The cast bronze body bags symbolise the three monotheistic religions in white, pink and silver patination. With reference to classical vanitas symbols, such as the skull, which in the 17th century were used in painting, Evaristti here uses the clinical symbol of today – the body bag. Box your way through the religions! Marco Evaristti has gathered together hair from hairdressing salons that cuts the hair of respectively Christians, Jews and Muslims. The hair has replaced the sand that is usually in the sand bags. 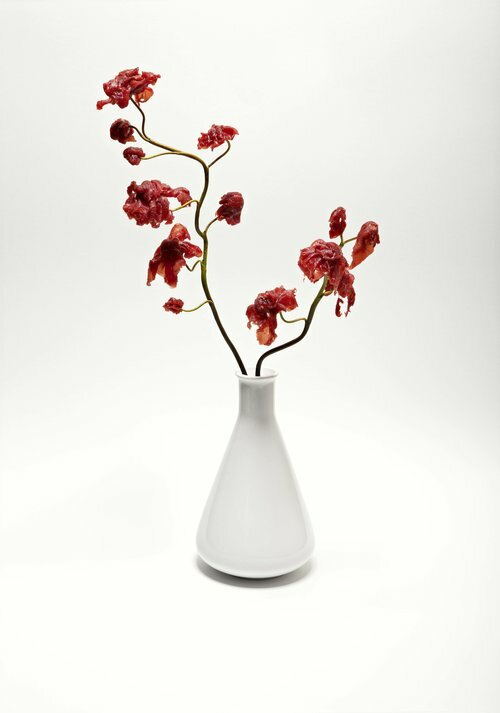 The photo series featuring the orchid-like flower in a vase demonstrates a process in which the flowers of meat slowly rot and fall off. All good things must come to an end at some time, including life. "All religions basically draw on the same thoughts and ideas. My new work “Forgive me, Helena” is a hope and a cry that the three major monotheistic religions can get along with each other better. The Bible, the Koran and the Torah are lying in an aquarium full of water, sand, plants and veil tails. With time they will dissolve and be returned to the great cycle of Nature. Life Auction is an art project that was launched by Evaristti in April 2012 with a major poster campaign in the streets of Copenhagen. The posters featured the text "do you have one healthy kidney too many?" Since then more than sixty donors have registered and after a consultation with a psychologist the kidneys are put up for sale on the website. Iceberg 2004. Mountain 2007. Desert 2008. Cloud 2008. Nature is infinitely rich and seemingly inexhaustible for Evaristti. His most recent development of Pink State took place in March 2013 in the small town of Hovden in Norway. On a skiing holiday in February he had fallen in love with a 70 metre high and 40 metre wide frozen waterfall. In Cityscapes are shown a metropolitan-like landscape, where tall and low buildings are standing among each other. The buildings are connected by ladders, which goes from building to building. The ladder is a common symbol in the works of Evaristti. It is to be seen as a well-known human eager to succeed – but really the ladder is moving in both directions. PINK STATE – Greenland, Mont Blanc, Sahara, Norway - now Iceland – Pink State has materialised again! The 5th Pink State, The Rauður Thermal Project, has seen the light of day. This morning the utopian state of Pink State claimed as it´s new territory the magnificent Strokkur Geysir in Iceland. When entering the atrium of Orifarm, one is met by an impressive art installation unfolding a story around the very topics the pharmaceutical company deals with. Gazing back to the Greek civilization and the roots of medical arts, the installation alternates in between abstract and naturalistic form.